Property owners often ask from designated authorities to conduct an appraisal on their property it could be an office, home, business antique etc. An appraisal is basically valuation of a property by the estimate of an authorized person. In order for the appraisal to be valid, it is necessary and important that the appraisal is done by a person of authority who holds a designation from the regulatory body governing the jurisdiction of the appraiser. You may also see Appraisal Form. A manufactured home appraisal form is a basic home appraisal form wherein details of the home to be appraised and information about the appraised need to be populated correctly. 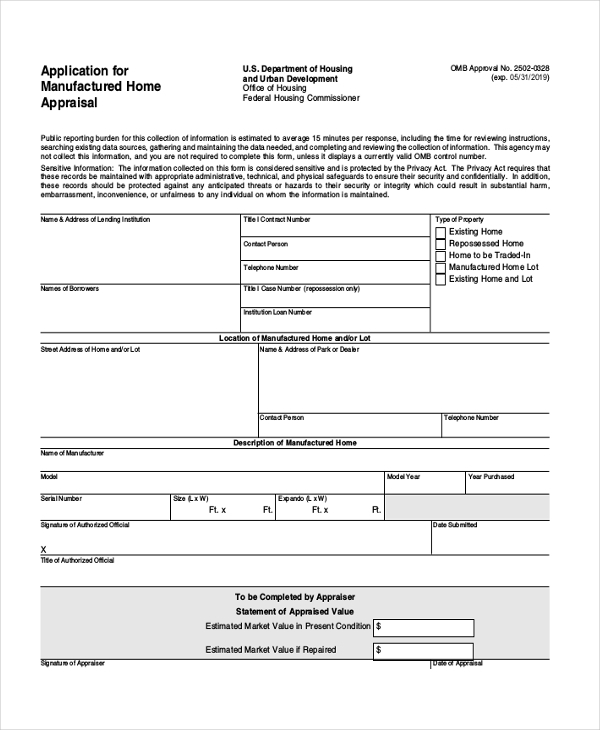 The address and contact details need to me specified correctly and all other fields including the signature of the home appraiser need to be specified at the end of the form. A home appraisal form contains fields under sections like Property Information and Client Information respectively. Type of home, Type of Appraisal, Other forms needed, Purpose of Appraisal must be specified clearly. The method of payment alongside the loan amount and estimated amount need to be populated with relevant numbers. 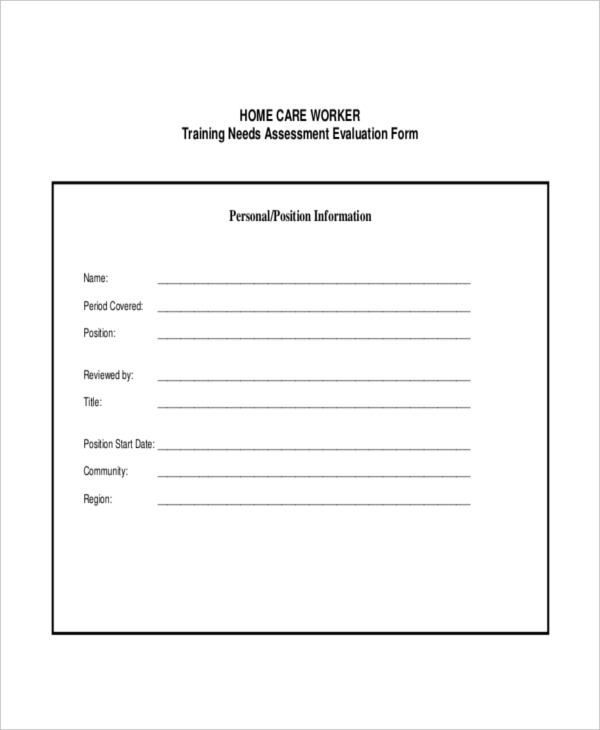 This is an appraisal form format which is ideally useful for supervisors who need to review and appraise employees working under them. Several fields and parameters are mentioned throughout the length of the form and the user needs to ensure that he or she inserts only accurate information. A home appraisal checklist is a list of items which need to be assessed and examined by authorities when evaluating the property – internal and external premises. This type of appraisal form is just like any other appraisal form except it has got a checklist of items which need to be closely looked at and remarked for accordingly in the form. 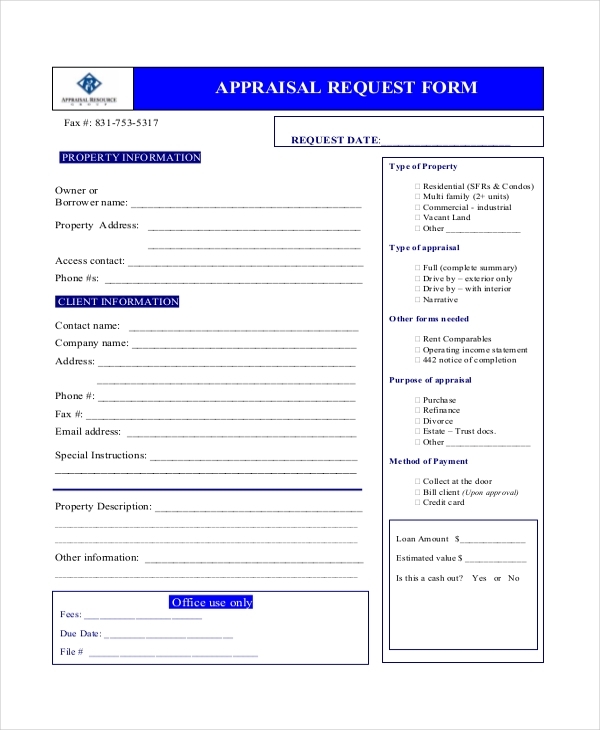 A uniform residential property needs to be evaluated and so, in that case, the appraiser is likely to use a form of this type. It is very elaborate and has the comprehensive number of fields and checklists which need to be defined with accurate and relevant information. In a residential appraisal report, the designated authority specifies information about the property evaluated. Details of its owner, purpose of appraisal, the amount calculated as evaluation must be inserted in the correct blanks in the form. 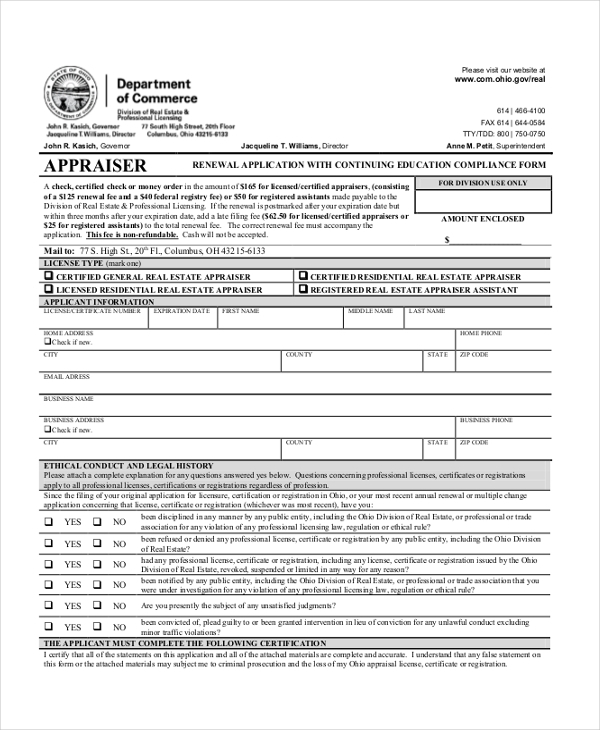 If a home appraiser would like to renew his designation/ appraisal license, he or she needs to populate a renewal application to the concerned authorities. The list of details sought in the form is extensive, applicant information, license type, appraisal continuing education etc need to be duly filled. Owners need to have their home/residential properties evaluated for a number of reasons – loan, mortgage, sellout, buyout etc. A home appraisal form assuredly indicates the specifics of the property examined, lists out the exact condition of the property which is being placed under assessment, and on the basis of several factors an authorized officer or appraiser gives an estimated price of the property. For this operation to be carried out successfully, a home appraisal form comes in as handy. You may also see Land Appraisal Form. 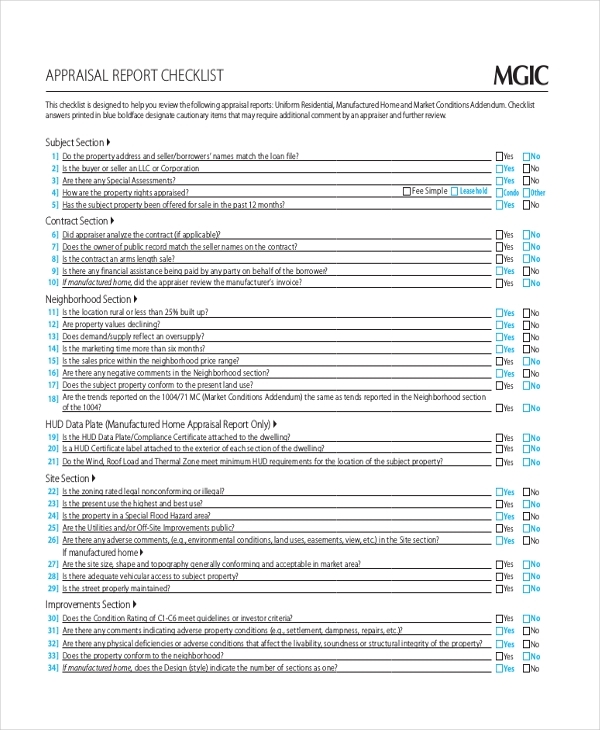 Where to Download These Home Appraisal Forms? If you wish to see examples of home appraisal forms, the Internet is your best friend. There is an abundance of websites from where users can easily access, download, customize and print readymade and editable home appraisal forms. The USP, of course, is that they are well-made readily and users just need to edit them based on their needs, and that’s also easy to do. You can also see Retail Appraisal Form. The home appraisal is an important activity for several reasons and having home appraisal forms is of big significance. These forms ensure that the appraisal is carried in a methodical manner and no errors are committed. We’re certain you would have got a better idea about the different types of home appraisal forms.